“Light, More Light!” is dedicated to the memory of the harpist, improviser, pedagogue, astrologer, friend, and mentor, Susan Allen. The title comes from the last line of Henry Miller’s sign that he penned, “Notice to Visitors”, which hung on his garden gate in Big Sur. Susie had a copy of this sign on her garden gate in Valencia, California, and I later had one in my own garden. The sign is worth a read. Trevor Berens is a pianist, composer, and music therapist. He holds degrees from Loyola Marymount University (BA: Music and Psychology, specializing in piano and composition), California Institute of the Arts (MFA: Performer/Composer), and Lesley University (MA: Expressive Therapies, specializing in Music Therapy). His former piano teachers include Tania Flesicher, Peter Miyamoto, and Vicki Ray, and his former composition teachers include Paul Humphreys, Stephen “Lucky” Mosko, Mark Saya, and James Tenney. 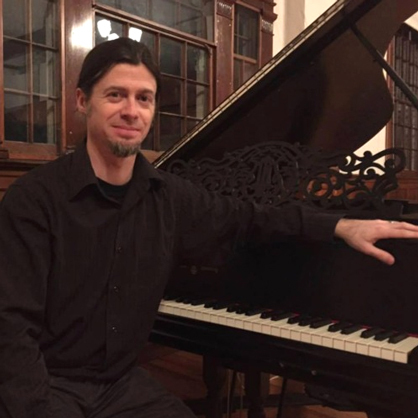 As a pianist, he enjoys playing in a variety of styles, including avant-garde classical music, traditional classical music, and free improvisation and as a collaborator, he enjoys working with a wide variety of individuals and ensembles, including solo vocalists and instrumentalists, chamber groups, dancers, and choruses. From 2006-2008, Trevor ran the Los Angeles Wholesale Orchestra, which commissioned and premiered multiple new works and he is now the founder of the Boston based new music group, Sonic Liberation Players. Currently, Trevor runs the Berens Voice and Piano Studio out of Lincoln, MA, with his wife, Jessica. He works as a music therapist working with young children and with the elderly. He is also accompanist for the Halalisa Singers.